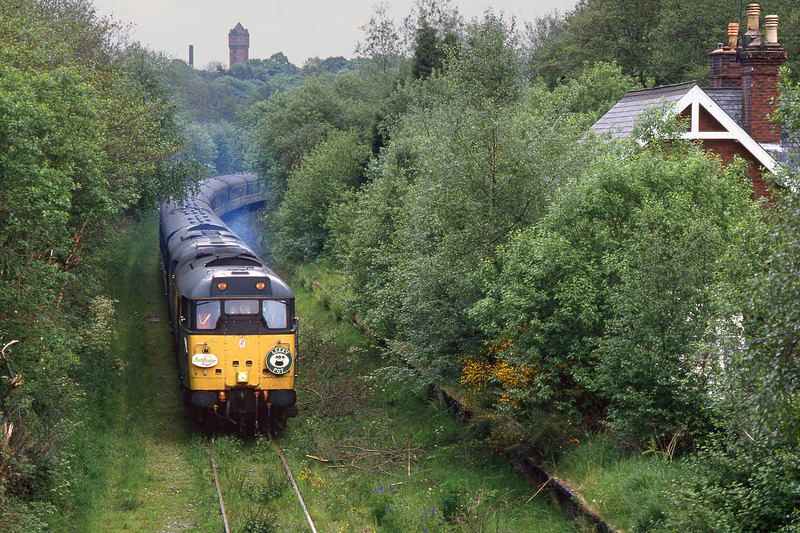 When Pathfinder Tours ran their 'Leeky Pot' railtour along the Caldon Low branch on 28 May 1994, the line hadn't been used for over a decade, and although some vegetation clearance was undertaken, the line was so overgrown as to be nearly invisible in places. This picture is a good example, with some slight signs of pruning, but with just the two rails visible in the grass, and small trees growing on the old platform of Wall Grange & Longsdon station (closed in 1956). With the overhanging trees brushing the roofs of the coaches, 31145 & 31302 slowly negotiate the verdant scene with the 1Z18 14:56 Caldon Low to Bristol Temple Meads 'Leeky Pot' railtour.